The Crusaders are the world’s most successful non-international professional rugby team. In 22 years of Super Rugby the Crusaders have won 9 titles, been finalists 13 times and semi-finalists 17 times plus they are the only Super Rugby team to complete a whole season undefeated. The Crusaders have a unique brand and brand signature that captures the hearts and minds of a significant proportion of the rugby loving public, not just in Christchurch but throughout the South Island, across wider New Zealand, and into the 45 countries that currently view their broadcast content on television. Reporting into the CEO, you will be responsible for providing strategic and operational leadership across the sponsorship and partnership team, aligned with the objectives of the organisation. The GM Partnerships will lead and manage the Crusaders commercial and partnership strategy and performance. This includes the commercialisation of core sponsorship assets and non-traditional partnership opportunities in relation to stadia, membership and community focused projects. You will develop and manage a sales pipeline with existing and new innovative assets and partnership propositions to drive growth in commercial revenues. You will also develop and manage relationships with commercial partners, to ensure renewals are secured and ensure that their contractual requirements are being fulfilled and standards exceeded. You will be required to participate in hosting partners, attending events as well as assisting in managing partnership specific activations. You will be an integral member of the Crusaders Executive Leadership Team and expected to develop a working knowledge of the Crusaders business, to ensure the brand remains an industry leader both on and off the field. • Senior experience in the development of commercial strategy, driving profitable innovation, leading people and partnership development. • Experience with developing and implementing successful commercial partner servicing plans and budgets plus proven capability in contractual rights delivery against set objectives and KPIs. • Ability to set a strategy to build the platform and culture for sustainable growth long term which delivers against bottom line numbers. • Outstanding relationship / stakeholder management skills and ability to navigate complexity and manage multiple agendas. • A leadership style that focuses on clear direction and building a strong effective team committed to achieving agreed objectives. • It is not imperative to have a background in sports/rugby administration, rather a background as an outstanding commercial performer in business. To submit your application, please apply here or send your resume and cover letter (in word format) to [email protected]. 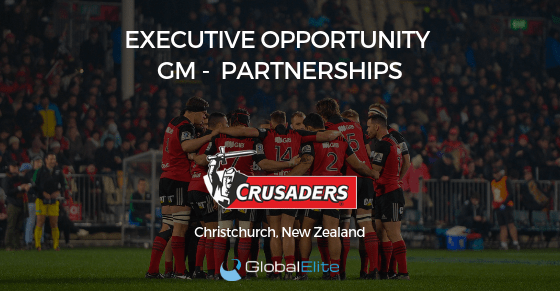 Global Elite Sports have been contracted by the Crusaders exclusively to manage the recruitment process for this position. Facebook LinkedIn Google Other Please select an option from the list above.